Length: 4" | Width: 0.09"
I use these as leg bands for my chicks, the size is just perfect for the little guys and all of the colors are awesome. I use the extras for keeping electrical cords organized. The colors are vibrant. Great colored cable ties, we used them to identify our chickens. 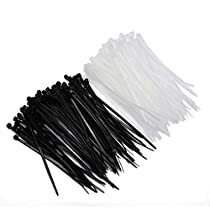 I purchased these cable ties in order to be able to identify my barred rock hens (they all looked the same otherwise). My husband and I carefully put a different color on each hens right leg and we every so often check to make sure they are not too tight. They are nice bright colors and are just the right size to use on standard sized chickens. Update: 5/10/2016 My hens still have their original bands on, I haven't had to replace any. Colors may not be quite as bright as they were of course but still can easily distinguish which hens are which. I was hesitant about ordering these with the mixed reviews but took the chance anyway. Product was exactly as described with the same range of colors shown in the image. Thanks!